If you are not getting as much business as you would like today, there are many things you can do to become marketing rich…which will lead you towards a goal of being monetarily rich and spread your influence as well! Marketing Rich is both a philosophy and a goal! Selling the solutions and benefits that your clients and future clients need using a variety of different marketing methods. Remember people want to know what is in it for them! Until you communicate to them that you can potentially solve a challenge of theirs, they don’t care how great your product or service is. Obviously, the goal of business is to make a profit, while the independence and freedom of being your own boss is a great benefit of business ownership that only goes so far if you are not making enough to make it worth your time. 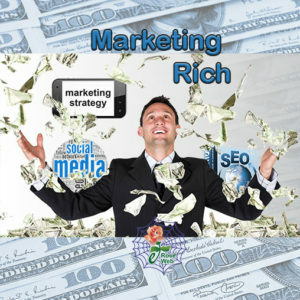 Marketing Rich as a goal means you not only have enough to provide a comfortable life for your family, but you have enough left over to give you more flexibility and freedom. When you achieve your goal of becoming marketing rich you can do many other things, whether you want start new ventures, give back to your community, spend more time with family, travel the world, you name it! Note: We do Not guarantee you will become rich through marketing, however the right marketing increases success rates for most businesses exponentially. Update at least the home page of your website regularly. The search engines may penalize you if they see the same content on your home page for a long time. Customize your email marketing to groups of prospects by area of interest. Even if you keep most of the content the same a few changes to the beginning of your email marketing that targets an interest of that prospect can significantly improve your results. Ask your vendors, industry organizations, and clients to put a link to your website on theirs or to mention the great work you are doing on your social media platform of choice. To develop a relationship with a social media influencer in your industry on twitter, retweet their content, add value on top of their tweets and be complimentary. Have your social media pose a variety of questions to find out what sparks participation from your followers. Some may be directed to limited selection of answers, some may be open ended or thought provoking questions. eRose web provides many digital marketing services with a focus on helping small businesses and Entrepreneurs to succeed. Our focus is custom websites (and customized WordPress websites) with a marketing focus, SEO, content writing, eMail marketing and Social Media Marketing integrated together for a Marketing Rich experience. We would love the opportunity to provide a proposal to Make Your Business Bloom! Stop and Smell the Roses…Remember to Enjoy being an Entrepreneur!